Lebanese outlet reports details from fateful incident in Gaza in which IDF Lt. Col. was killed in battle with Hamas. 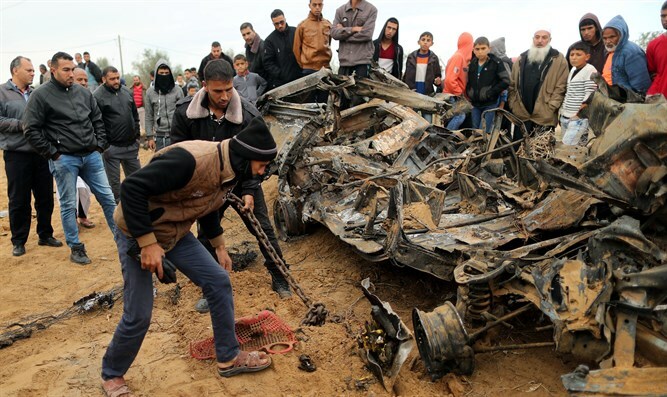 New details emerged Wednesday regarding the fateful IDF special forces operation deep inside the Gaza Strip earlier this month, which ultimately resulted in a pitched battle with Hamas terrorists outside of the city of Khan Yunis in southern Gaza. According to a report Wednesday by the Lebanese newspaper Al Akhbar, the officers in elite IDF special forces unit which was involved in the botched operation had entered the Gaza Strip at the Erez crossing point using fake identification cards. In addition, the report claimed that the officers entered the Strip at separate times, so as to avoid suspicion. The team’s equipment was smuggled into the Hamas-controlled coastal enclave through the Kerem Shalom crossing, where it was picked up by an agent working for Israel inside the Strip. The agent is also said to have secured two cars for the Israeli special forces team. Posing as workers for a Palestinian Arab telecommunications company, the Israeli team placed listening posts and spy equipment for intelligence gathering at key points inside the Gaza Strip. A separate report by Hahadashot claimed that the team also attempted to kidnap or assassinate a senior Hamas terrorist in the Strip during the abortive mission, a claim the IDF earlier denied. The team was reportedly stopped by Hamas terrorists during a roadside check inside the Strip. When the Hamas terrorists became suspicious and ordered that the Israeli team be taken in for questioning, the Israeli officers opened fire, killing several terrorists. The two Israeli vehicles then fled, while being pursued by several patrol vehicles manned by Hamas terrorists. One officer, identified only by his initial and rank, Lt. Col. M, was killed in the incident, while another was seriously wounded.